The first time I had an Irish coffee I was in a bar in a small town outside of Dublin watching a cover band. I had just spent a week in Dublin, and during my trip (as is prone to happen) I had made a friend who happened to have a band that happened to be playing the last night I was in town. It seemed like I needed to go. The new friend sat me down with his family, who had all come out to hear him play, right before they went on stage. Five minutes later, the table of older women had discovered I had never had an “real” Irish coffee and had started buying them for me. Lots of them. By the end of the night I was exceptionally caffeinated, had a group of new friends, and a newfound love of the Irish coffee. In America, an Irish coffee typically entails just a cup of coffee with whiskey in it. In Ireland, it’s a work of art. Check out the Irish coffee picture above from one I had at Jameson in Cork. 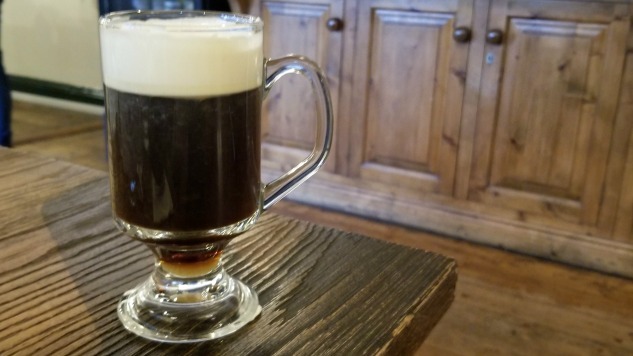 If you’re looking to have a low-key Saint Patrick’s Day this year, or just want a drink you can have with brunch before the real festivities get started, I highlight recommend giving an Irish coffee a try. Here’s a slight rift on the original recipe Slane sent me this year that should get the job done. That cream float is key, so don’t skip it! Directions: In a heatproof Georgian glass, add Slane Irish Whiskey, Demerara simple syrup and coffee. Leave room at the top for the heavy cream. Stir gently. Float a thin layer of cream on top. Garnish with a healthy grating of fresh cinnamon.